There is nothing better than finding sweet, summer raspberries at the peak of freshness. If you’ve bought them at a farmer’s market you might find that you have a few baskets and no apparent use for such bounty. My favorite way to make use of this kind of market abundance is to make ice cream. 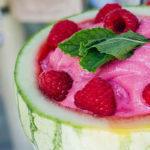 Our amazingly vibrant Raspberry Banana Ice Cream is a great recipe to whip up on a hot day. It’s almost electric color is enough to get any kid excited. This super-simple to make has only 3 ingredients and takes less than 10 minutes to prepare. Cashews are the secret to making this banana ice cream vegan-friendly, creamy, and delicious.